The east wind doth blow and…..boiler stops working! Late february 2018 brought a period of sustained cold weather from eastern Europe.This cold spell caused many thousands of boilers to stop working, at the very time when heating was most needed. The boiler buoy is now proving the saviour for many households, its simple design will allow the boiler to be reset and start working in a few minutes. The UK winter weather can vary widely, but one thing is guaranteed. When the temperature drops below zero for a period of time, condensate boilers start to lockout due to the frozen discharge pipe. The Boiler Buoy is the a simple, low cost solution to this problem which invariably is short term but causes significant home occupier disruption just when warmth is needed. The Boiler Buoy can be fitted by a service engineer or plumbing DIY homeowner. Boiler Buoy is so simple !! Beast from the East !! As parts of the UK prepare for the coldest winter weather in recent years, condensing boilers which produce water as a by product become more at risk of breaking down if temperatures remain at sub zero for a prolonged period of time. 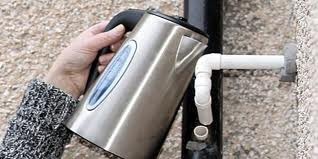 If the boiler stops and a gurgling noise is heard then a blocked condensate pipe may be a cause especially if the temperature is negative and the pipe goes to an external drain. The boiler buoy can give a simple indication that this is the problem and has a easy to operate tap to bypass the blockage and allow the boiler to restart. By the end of this week temperatures are likely to fall and some regions will be negative by day. This is a possible repeat of the 2010 and 2011 winters when many households faced condensing boiler shut downs. Seven years on there are another 10 million condensing boilers installed and though regulations reduced the condensate freezing risk, external perpetual negative temperatures will stop boilers working. Is this what you want to wake up to? 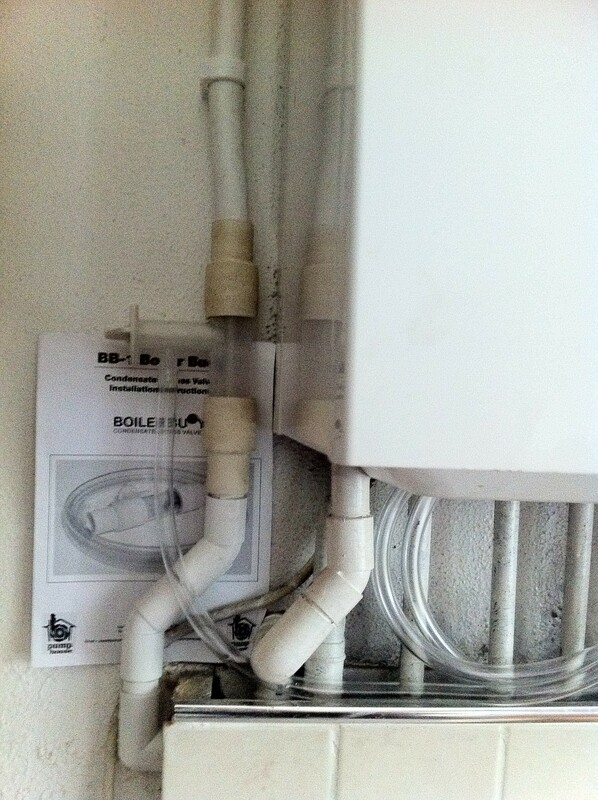 Take action for frozen condensate pipes…. Fit a Boiler Buoy and keep the kettle for that Cuppa! Many housing associations have fitted the Boiler Buoy during the summer annual servicing, with heating engineers holding van stock for emergency call-outs. Home owners should contact their local engineer for advice on frozen condensate issues, or purchase a Boiler Buoy at a local merchant. Wrekin Housing Trust near Telford have installed the Boiler Buoy to reduce issues associated with condensing boiler condensate freezing. They have issued guidelines to residents to open the drain tap during any cold spell and periodically check the container. This successfully stops any boiler lockout in the event of freezing, liquid is only collected if freezing occurs, all very simple and no energy used unlike trace heating.